After blogging about food for five years, it really takes a lot to impress me. Sometimes it feels like the food world is saturated with dozens of the same products, just with different labels! 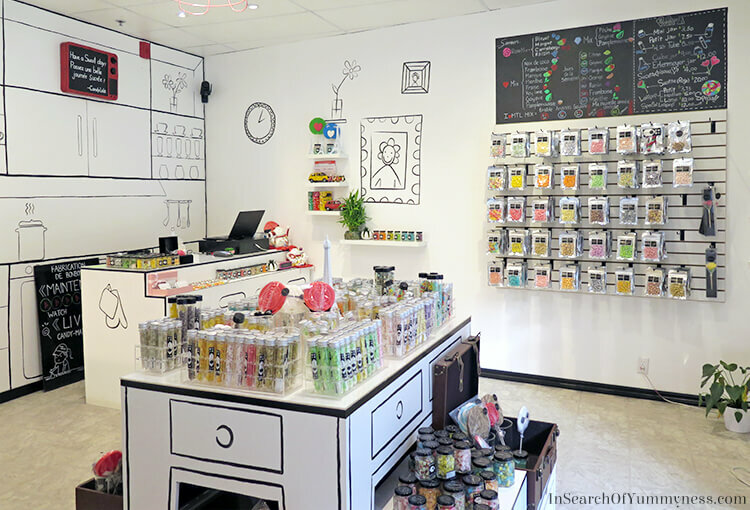 So when I came across CandyLabs during my trip to Montreal, and I felt a compulsion to buy everything in the store, I knew I had found something special. 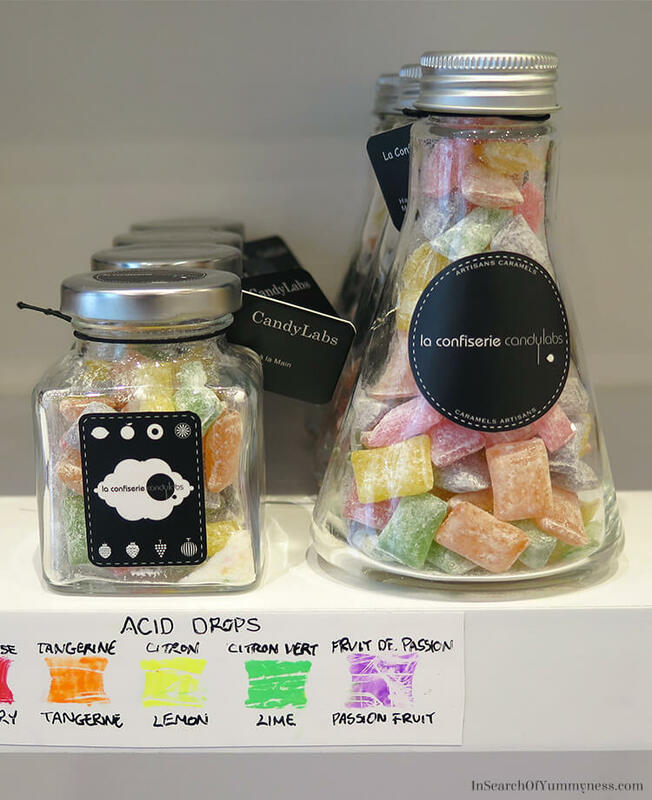 CandyLabs is a fairly new artisan candy shop located in Montreal, Canada. 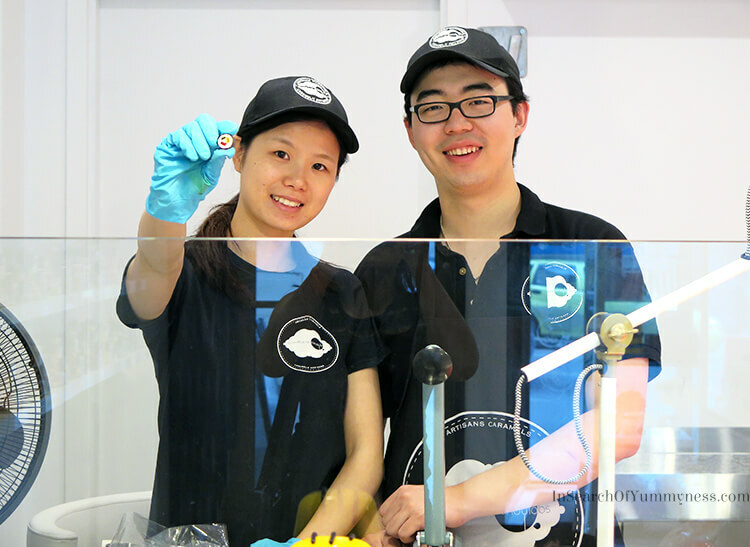 The tiny store is owned and operated by Lin Geng and May He – an adorable couple who dreamed of opening their own candy store. Lin and May knew that if they were going to be successful, they would have to create the best sweets that they possibly could. So, they went off to Australia to learn the traditional techniques for making hard candies. 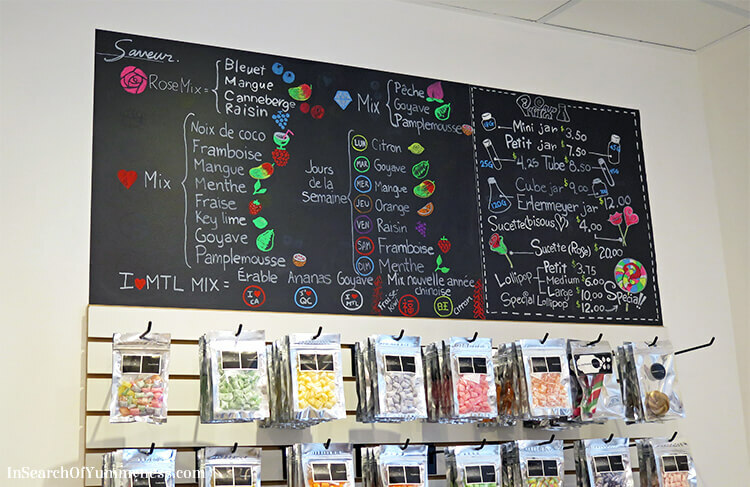 After studying with a professional confectioner, they returned to Montreal and opened La Confiserie CandyLabs in 2014. They have been creating unique and delicious sugar confections ever since. 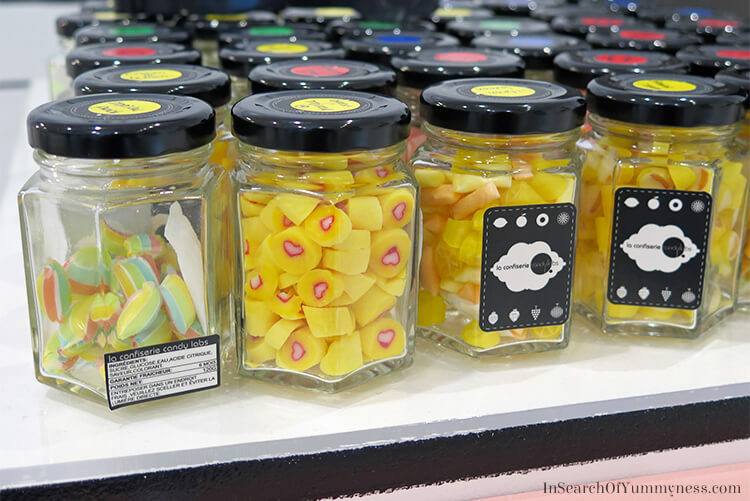 While the techniques behind the candy might be traditional, their products are anything but. 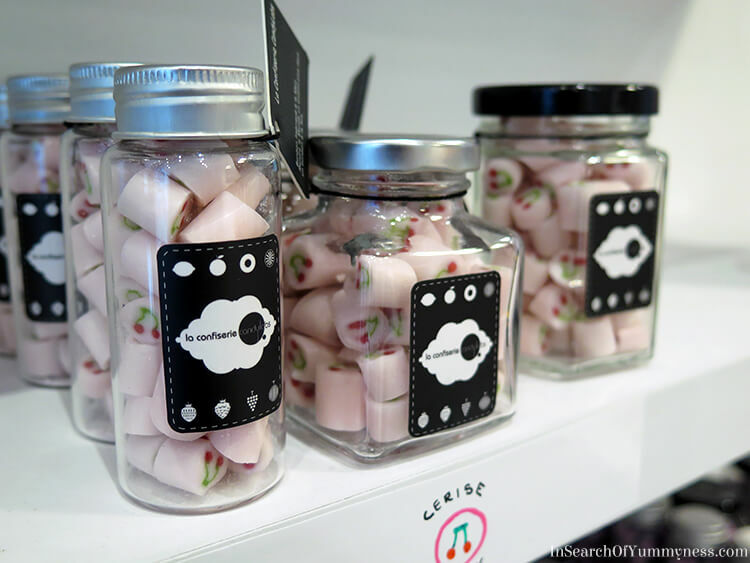 Lin and May come up with all kinds of unique products like candy that looks like sushi, clear candies with little sheep pictures in them, and rose-shaped lollipops. It actually reminds me of one of those escape-the-room places that are so popular these days. The walls are painted a stark white, with a cartoon-like decor of drawn-on shelves and artwork. 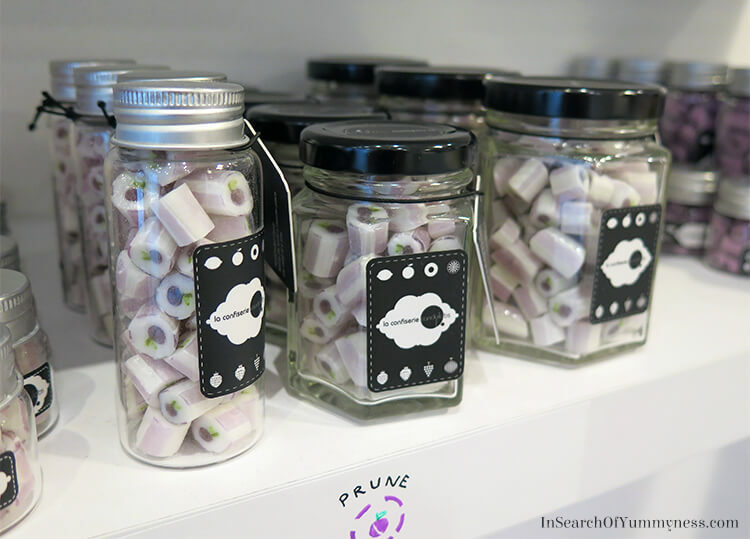 This clever design allows the candies to stand out, as their vibrant colours shine through the glass bottles. 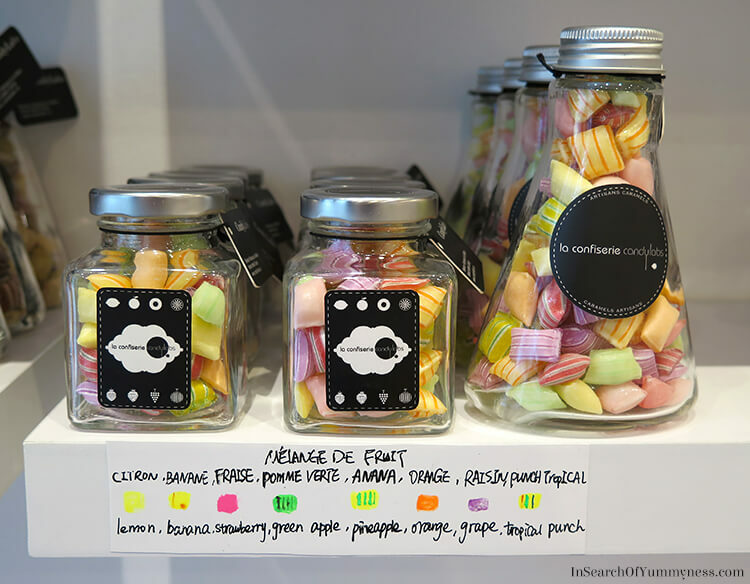 It was the colours of the candies that caught my eye through the stores window. My friend Mandy and I were actually on our way to an Asian dumpling restaurant, when I noticed the beautiful rainbow displays. We didn’t have time to stop right away, but we made sure to visit the store after we had our lunch. And honestly, I’m so glad that we did! We sampled several flavours of candy while we were at the store, but we only touched on the huge variety that Lin and May carry. Their flavour list includes blueberry, mango, guava, strawberry, cherry, cola, tangerine, grapefruit, lemon, banana, orange, coconut, mint, champagne and more! I ended up buying a bottle of mixed fruit-flavoured candies, and a package of sour Acid Drop candies in tangerine. The Acid Drops are really good! They are sour enough to make your lips pucker for a moment, but they’re not ridiculous like the sour jawbreakers I use to (attempt to) eat as a kid. You can still taste the flavour of the candy underneath the citric acid. 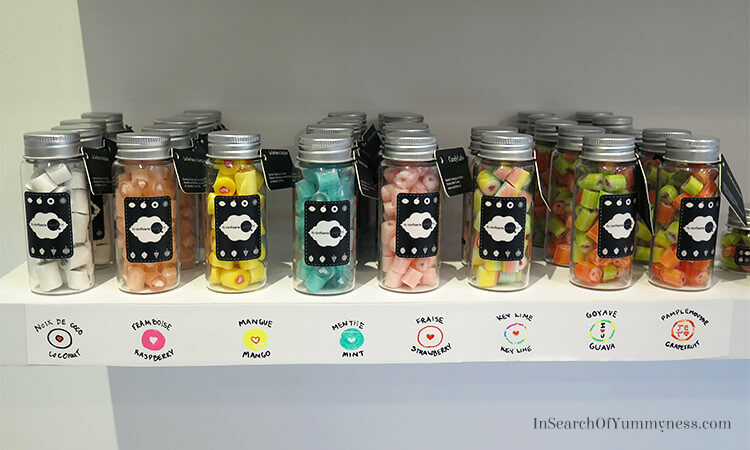 If you live in Montreal, or are planning to visit soon, be sure to look for the CandyLabs store on Rue Guy. May and Lin will be happy to give you a few samples, and I know you won’t be disappointed! Did you think I would leave you hanging?? Lin and May were kind enough to offer my readers a 15% discount on their online orders of $10 of more! Just enter ISOYN at the checkout, and you should be good to go. If you run into any issues at all, just let me know and I’ll help you out. Hand made candy is a lost art, they have great talent and their candy tastes amazing! It’s true, you don’t see a lot of handmade candy anymore. I just don’t understand how I have STILL not managed to go there! And I love candy! It’s such a lovely shop Janice, you must go! They’ll give you samples! That place looks like so much fun! 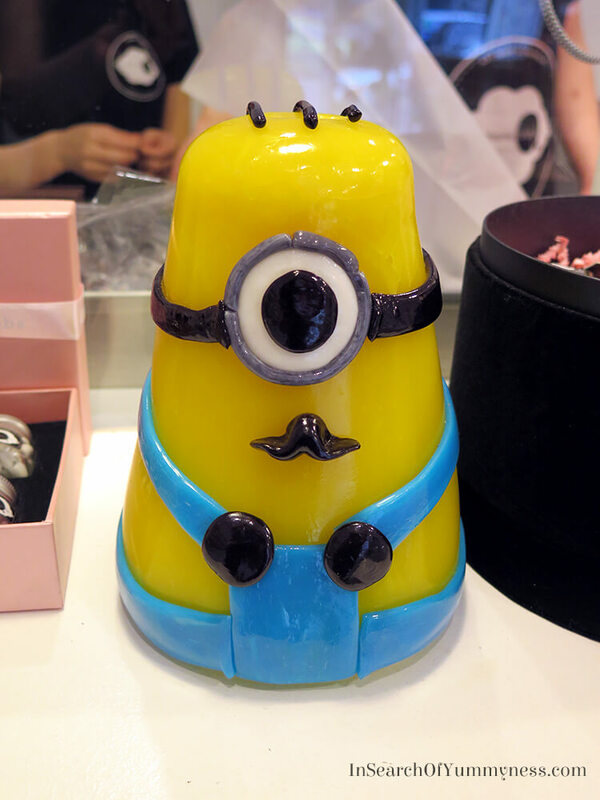 I LOVE the minion! Too cute. It’s such a fun store, we spent over an hour hanging out in there!